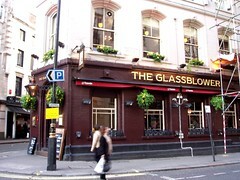 A recently redecorated pub, serving well-kept real ales, in Soho, just off Regent Street. Being a wedge-shaped corner location, the room is shaped as such, with tables fanning out from the door along the two walls, under the windows, though the place remains fairly dark. There are a few other tables by columns supporting the roof, but the centre of the pub is empty, presumably to accommodate the drinkers packing in here after work. All the tables (of which there are around 12) are tall ones, with high stools. There's also a bookable upstairs room, but this wasn't open on the Tuesday lunchtime when Ewan visited. A selection of AOR music was playing, perhaps a touch loud (though hardly deafeningly). Service was friendly, and the clientele seemed to be mostly made up of tourists or shoppers wandering in off Regent Street. At the bar are four handpulls for ale, which in July 2009 had London Pride, Adnam's Southwold Bitter (£1.43/half) and Shepherd Neame Whitstable Bay, with one off. Howard called in during March 2008 and tasted the Butcombe Brewery Traditional Bitter and the Black Sheep Best Bitter, both excellent. Ale is well-kept, and there's also plenty of premium draught lager options, such as Hoegaarden, Leffe, Beck's Vier and Staropramen. The food menu is standard Spirit Group stuff, and when ordered comes out fairly promptly photo of menu in July 2009. Ewan's "superfood salad" (£6.30) photo featured beetroot, peppers, red onions, all fresh, and was topped with a mint raita ("garlic and mint yoghurt dressing" on the menu) and a handful of pumpkin seeds. Perfectly good for a pub salad, really. Signs inside the pub indicate there's a pub quiz on Monday nights, and poker on Tuesday nights. It's not clear from the signs whether this is every week. Accessibility: Gents toilets are downstairs, and the ladies upstairs. Last visited by Ewan, 14 July 2009. Last edited 2017-02-05 19:41:14 (version 16; diff). List all versions. Page last edited 2017-02-05 19:41:14 (version 16).